The macaron is a puzzling piece of confectionery. It can either be a good day for it or not. Some days, macarons are just in the air, those egg whites all ready to be whipped to the ceiling and back. But not any dull old day will do for the dainty lady to make her appearance. She prefers a dry and sunny day over humid dampness, and, however unfair it seems at times, that is her prerogative. She'll only get off her feet and grant you a glance at how her skirt falls perfect over her calves when she is ready and feels like it. Even if the French method of making her is said to be superior, nothing beats the Italian embrace when it comes to the meringue; little danger of beating your beloved confectionery to death. And with the added bonus of a nice chewy macaron at the end of the roller coaster ride that is called macarooning. Here we go. BreadLab goes 'epic recipe'. Put the fine table sugar in a pan with 5½ TBS of water. Use a thermometer to prevent the sugar going over 110C. Resist the urge to stir the water/sugar mixture for the best result. At the same time, start making the meringue; whip two egg whites (80 gr.) to the point where it has soft peaks (see video for a visual). Have your sugar-syrup ready at this stage, and add it to the meringue on high speed. Keep mixing on high speed until the meringue has cooled back to about 45 to 50 C. This can take quite some time; don't worry, you can't really over beat Italian meringue. While the meringue is cooling, combine the almond/sugar mix with the other 2 egg whites (=80 gr.). When making colored or spiced macarons, incorporate them now without having to worry about deflating your meringue too much. Tip: Split the eggs up to a day before you whip them up. Just split them and leave them (covered) out of the fridge. Eggs on room temp always do a better meringue than stone cold ones. If you are going out of your way to use fresh eggs for macarons; DON'T! 'old' eggs work better. If you live somewhere with high humidity, chances are you won't produce a meringue as enthusiastic as in dry and sunny places. And of course; always make sure you work with properly washed and thus grease free utensils for the best result. When the egg whites are incorporated in the 'flour' and the meringue has cooled sufficiently, work in the meringue in two halves. This is what is called 'macaronage'. You will loose some volume. Don't worry too much about that, it's logic. Just try and be as consistent as you can in working in the almond paste with the meringue. This is the most difficult part to get right in making macarons; mix too little and the macarons won't be shiny, look quite coarse, and probably won't 'ooze' into the right shape. Mix it too long and you will loose too much air in your mix and the batter will become too runny and will produce flat macarons. Practice makes perfect! Use a flexible rubber spatula to mix without loosing too much of your volume. Look at the video again and get the basic movement right; you go around the bowl, and then, with the flat end of your spatula, 'smear' what you have accumulated onto the center. You are just about done when the mixture gets a bit of a gloss to it and the sugar and almonds are completely incorporated . When folded back onto itself, the mix should keep its shape. If it immediately disappears into the rest of the mix, you have gone too far and your mix might be too runny to produce a macaron that will look like what you are dreaming of. Remember that, after putting the mix into the piping bag, the last macarons you squeeze out of the bag tend to be more runny than when you started; this is because you have been squeezing out some of the air in the process of piping. Nothing to worry about; just realize it when you are piping your macarons, and try to be gentle. 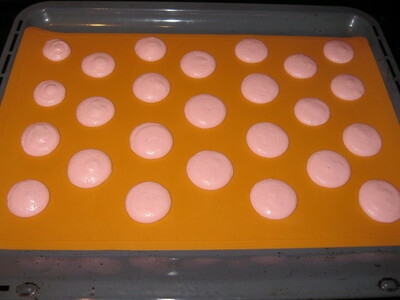 If your batter is a little too thick, tap the baking sheet on the table to force the macarons into shape. Pipe the macarons onto a quality silicone baking sheet. Make 3 cm dollops about 2 cm apart. Try to be as consistent as you can, but don't worry too much about getting it right; when baked you will pair up 'matching' halves to make perfect macarons. Baking paper can be used as well, but a silicone is worth investing in if you don't want to bother with a hundred ways to keep your macarons from sticking, and they WILL stick on paper. Another advantage of silicone is that it 'holds' the batter in shape much better than paper. Your macarons will be rounder and won't ooze out as much as on paper. If you are baking on silicone there is a nice trick to see if your macarons are ready after baking; Take the macarons out of the oven; if you can pick them off the baking sheet really easy you have either produced the perfect macaron, or you have over baked them. When they still stick when you give them a careful quart twist on the baking mat, put them back in the oven for a few more minutes. After piping you need to be patient. In order to get the elusive 'feet' on your macaron, leave them to dry, uncovered. The skin of your macaron should be dry to the touch before they can go into the oven. It can take anywhere between 30 minutes and a few hours, depending on humidity and general conditions in your kitchen. On a dry and sunny summer day, it will go the fastest, on dreary damp days, or when it is really humid, you might have to be patient for what seems like an eternity. Only when there has formed a proper 'skin' on your macaron, will it produce the characteristic 'feet' while baking. Preheat the oven to 145 C. Bake the macarons for about 13 to 15 minutes with convection if possible. Let them cool on a rack after baking, make the filling of your choice (there is hundreds of them! 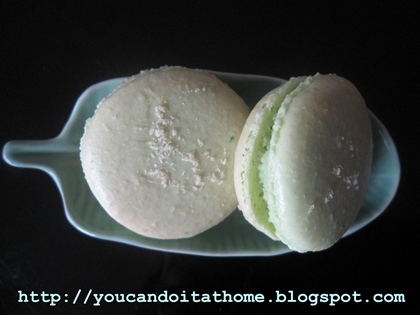 ), pipe it onto one half, and carefully put the other macaron half in place. They keep for quite some time. Some people like to eat them after at least one night of refrigeration, others prefer to eat them as fresh as possible. My recent obsession with Macarons. No actually, I've been obsessed with Macarons for quite sometimes...but my first attempt at making macarons was a total disaster. So much so that I dreaded making them again. It took me another year to come up with enough courage to give it another try. I still remember the first time I bit into my very first macarons. It's from a french patiserrie in The Rocks, Sydney. It's passionfruit macarons...and it just taste sublime and so heavenly....umm macarons, my new best friend. My first attempt making hem was absolute disaster. The batter was too runny. They weren't cooked. They stuck to the paper. They were all broken. It simply put me off making them almost forever. Somehow, I regained my urge to try making them again....this time around with better luck, better tools, better educated. I must say that macarons are not that difficult to make. I found some similarities between making bread and macarons. Both are consisted of basic ingredientsthat always presents in them. Bread --- flour, water and salt. Macarons --- almond meal, egg whites and sugar. Both start with the basic and you can improvise and let your creativity guide you...to develop flavours that you like. - Basic Macaron Recipe using French meringue technique - a simpler French meringue technique where sugar is gradually mixed into whipping egg white. - Basic Macaron Recipe using Italian meringue technique - a little more complex method where cooked sugar syrup is gradually poured into whipping egg white. More tools and processed involved, but the result is more predictable and give shinier crust. Rosewater Buttercream Macaron - Macarons with rosewater Swiss buttercream (made with egg white). It was light, delicate and very fragant. Recipe and full post is here. Lemon Cheesecake Macaron - Macaronwith slight tart lemon curd and cream cheese filling. Pistachio Buttercream Macaron - A French classic flavour with ground pistachio macaron shell and pistachio buttercream filling. Passionfruit Macaron - Pairing coconut and passionfruit together, with coconut in macaron shell and passionfruit milk chocolate ganache. The sweet & toasty flavour from coconut matches well with subtle flavour of passionfruit. It was the first macaron I ever tasted, passionfruit macarons. Another bite of this macaron made me relive that special moment. The full post and recipe is here. Blueberry Cheesecake Macaron - Combining two of my greatest loves in one bite, Cheesecake & Macarons, nothing can go wrong (for me anyway). The macarons are filled with blueberry cream cheese filling. It's heavenly...my mouth is still watering thinking about it:) The full blog post and recipe is here. Cherry Ripe Macaron - Macaron with coconut in shell and the cherry-coconut-chocolate ganache as a filling. Coconut smells heavenly when baked and bitten. The recipe and more photos are here. Black Sesame Macaron - One of the yummiest macaron I made so far. The shells were made with mixture of almond meal and ground black sesame seeds, which provides fantastic aroma and the nuttiness of sesame seeds. The filling was also made from ground black sesame seed mixed with white chocolate ganache. Recipes and more details is here. 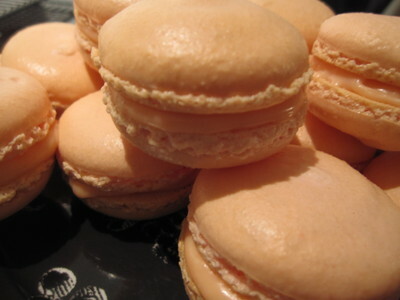 Salted Caramel Macarons - Really what can go wrong with caramel, that heavenly caramelised sugar with cream and butter. And with a little bit of salt, sandwiching the almond meringue cookie together. It's pure heaven! Recipes and more details is here. Raspberry Chocolate Macarons with hearts - macarons with raspberry chocolate ganache fillings, chocolatey with subtle raspberry flavours. The shells were sprinkle with sugar-hearts (cup cake decorations). They'll make a perfect treat for your Valentine's. Rosewater Macarsons - Rosewater is simply a beautiful flavour and it matches the delicate texture of macarons perfectly well. 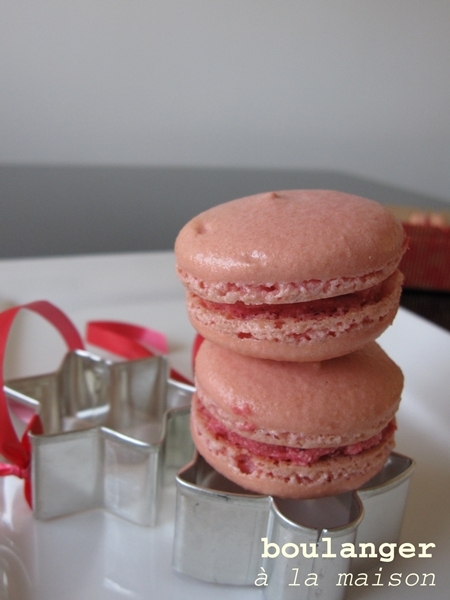 I found floral flavour to work really well with macarons and rosewater is no exception. For recipes and more photos, you can follow the links below. Jaffa macarons: macarons with orange dark chocolate ganache - macarons filled with my favorite chocolate flavour, dark chocolate and orange. This is one of my favorite. The bittersweet orange marmalade works really well with chocolate, as well as the macaron shells. I mix my homemade marmalade through chocolate ganache for the filling. Chocolate macarons - though simple, but never boring. I guess we all understand why chocolate is one of the most loved food. These macarons are perfect for chocolate lovers. 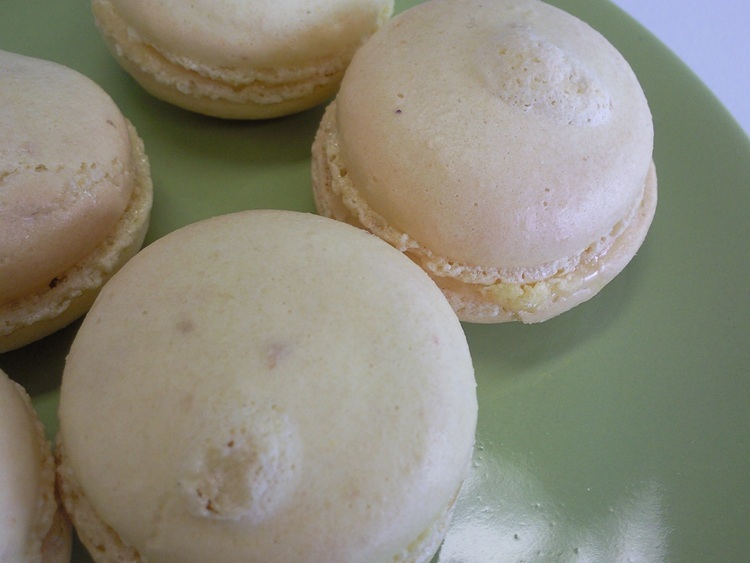 Lavender macarons - infuse the cream with lavender before making the ganache filling. My place was very aromatic when they were being baked...lavender smells wonderful. Caramel peanut macarons - I included ground peanut into the shell mixture and peanut praline into the caramel filling.